Exciting progress is being made at Gevo Inc.'s Luverne, Minnesota, renewable fuel plant, and also within the company's recent commercial activities, Gevo CEO Pat Gruber reported during the company's third quarter conference call. California ethanol producer Aemetis Inc. reported record earnings for the first three quarters of 2014, turning the company around from the losses reported in 2013. For the first nine months of the year, Aemetis reported revenues of $166.2 million. Ergon BioFuels LLC, a subsidiary of Ergon Inc., has announced plans to restart its 60 MMgy ethanol facility in Vicksburg, Mississippi, beginning May 2015. 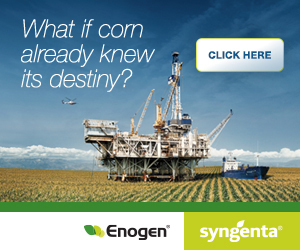 Ergon BioFuels is one of the largest ethanol producers in the southeastern United States. A group of agriculture organizations recently issued a letter to President Obama asking him to intervene in the U.S. EPA's proposed cuts to the 2014 renewable fuel standard volume obligations. The final 2014 rule is expected to be released soon. Class I railroads have filed their fourth weekly status reports with the Surface Transportation Board. The reports provide an overview of operational performance for the week ending Nov. 8. U.S. rail traffic, including carloadings of all commodity types, has increased 4.5 percent through October compared to the same period in 2013. Increased movement of grain represents the biggest commodity increase in rail traffic so far this year. The U.S. Energy Information Administration has published the November issue of its Short-Term Energy Outlook, predicting that ethanol production will average 934,000 barrels per day next year. Missouri Gov. Jay Nixon will serve as the 2015 vice chairman of the Governors' Biofuels Coalition, while Iowa Gov. Terry Branstad will serve as chairman. In 2016, Nixon will transition to the role of chairman. The recent drop in gasoline prices raises the question whether ethanol's competitiveness in blends is being threatened. University of Illinois economists Scott Irwin and Darrel Good examined the prices relationship in a recent FarmDocDaily post. Biofuels now account for 1 percent of global energy use, a new report from the United Nations Conference on Trade and Development finds. The document provides a sweeping global overview of the development of liquid biofuels. Brazil-based Cosan has released financial results for the third quarter, reporting a 2 percent increase in the volume of ethanol produced despite a 9 percent reduction in sugarcane crush volumes. Murphy USA Inc. has released financial results for the third quarter, reporting $6 million of operating income from its 110 MMGy ethanol plant in Hereford, Texas. The company posted a loss of $900,000 for the facility during the same period of 2013. An international research team led by Dan Distel, director of the Ocean Genome Legacy Center of New England Biolasbs at Northeastern University, has discovered a novel digestive strategy in shipworms that could benefit biofuel development. Enerkem Inc. recently announced it has signed an agreement with AkzoNobel to develop a project partnership to explore the development of waste-to-chemicals facilities in Europe. The International Energy Agency has released its annual World Energy Outlook, revealing that fossil fuel consumption subsidies reached $550 billion in 2013. According to the EIA, those subsidies discourage investment in renewables. IGPC Ethanol Inc.'s fuel ethanol facility in Aylmer, Ontario, has now produced over 1 billion liters (264.17 million gallons) of ethanol, a substantial milestone in IGPC's history. The facility has been in operation for more than six years. Xylome Corp. has signed licensing and equity agreements with the Wisconsin Alumni Research Foundation to develop and market unconventional yeasts with the power to transform tough biomass into sustainable fuels and chemicals.